Random Acts of Fresco Boutique & Fresco Mexican – Nicely Paired! Become A Sponsor for the Chester Wine Festival…it’s easy and effective! Chester Wine Festival – It’s a Celebration of Wine Downtown! 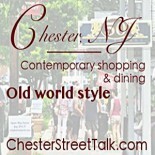 Chester Borough, NJ Shopping & Business Video – Very Cool!